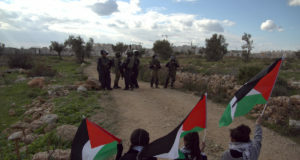 Around 1500 demonstrators attended today’s second anniversary protest against the Apartheid Wall in Bil’in. Despite the peaceful nature of the protest the IOF used violent means to try to disperse the crowd, including firing sound bombs directly at protesters at close range. Several needed medical treatment for injuries incurred when the sound bombs exploded on them. Before today’s march to the Wall protesters had a chance to view a photo exhibition of the two years of resistance in Bil’in as well as some of the props used in various creative actions. 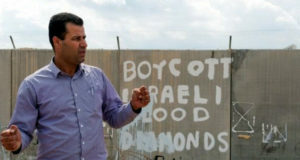 Bil’in villagers were joined by other Palestinians, including two Palestinian Legislative Council members and Member of the Knesset Jamal Zahalka, as well as 200 Israeli activists and 50 internationals. 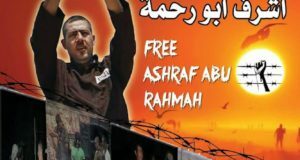 On reaching the gate in the Wall the villagers chanted resistance slogans and waved Palestinian flags. When some protesters climbed onto and walked along the gate soldiers tried to push them off. The restraint of the soldiers lasted longer than usual, perhaps due to the large media presence, but a few stones thrown at them was the trigger for them to use tear gas and sound grenades against all the protesters. Several were hit directly with the sound grenades . They then invaded through the gate and started firing rubber bullets at children throwing stones. Some activists went down the hill and started dismantling some razor wire. A water cannon was brought up and used indiscriminately against everyone, including the media, but this didn’t have much effect. When a small group of 20 protesters sat down in front of the gate soldiers tried to remove them violently but failed. Then several bursts of water were sprayed at them but they remained steadfast. Others standing near them had sound bombs thrown at their feet, which exploded causing deep cuts on their shins and ankles. Two had to be carried away to have their injuries bandaged. One Israeli activist was arrested. There were 20 injuries from sound bombs and rubber bullets, including three journalists.